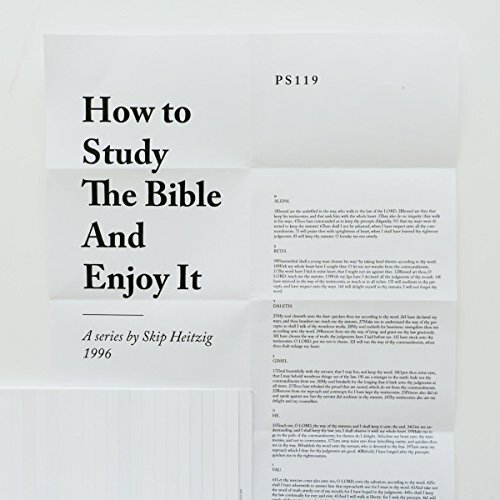 HOW TO STUDY THE BIBLE AND ENJOY IT. Except made bible study relaxing and enjoyable experience I've shared this app to all my friends, if you are a committed Christian and you find it difficult to study the bible this is for you. Great book loaded with good info. Skip is a very good speaker. Could not give book 5 stars because strickley speaking it isn't a book. It is 8 sermons put togethar. Highly recommended. And you can't beat the price. If you've ever wanted to know how to study the Bible, this is a study for you. Skip gives you the insight and the tools you need to learn more about God and fall more in love with Him as you do it!!! You will enjoy this!!! This recording is very distracting because it is merely a recording of live sermons, complete with announcements given to the live audience. It would be so much more valuable, and I would be willing to pay more for it, if the author took the time to go to a quiet place an speak directly to the audible audience. I have been a Christian for a long time. But studying my Bible has been something that has been a little harder for me, after listening to this wonderful book I am super excited cannot wait to get into the Bible and apply the things I have learned. The author of this is very exciting to listen to very knowledgeable and creates an excitement in you. What did you love best about How to Study the Bible and Enjoy It? Some excellent ideas to give your devotional life a "fresh" feel. What was one of the most memorable moments of How to Study the Bible and Enjoy It? One particular idea presented that I'm going to implement. What about Skip Heitzig’s performance did you like? All around good book for the beginner or more experienced Christian. Wonderful overview of the joys of studying God's Word! Helpful for all Christians, new or reasoned. This is not what you would expect. I was looking for a book with specifics about how to better study the Bible. This is a minister speaking in church and also mysteriously includes someone giving church announcements. Enjoyed the listen. Skip captivates and reels you in to only satiate your interest with practical take away guidelines on how to accomplish meaningful and fruitful bible study. all your favorite books on eBook all your favorite books like the Bible new King James Amplified Bible at all your favorite Bible and other book you can listen to on the go like on the bus in your car or at home. This is truly a fantastic study tool for someone hungry to learn more in their quite time.